The Spring/Summer collections may be arriving, but it’s 2 degrees outside in London, and I’m continuing a season-long love affair with roll necks. The wonderful thing about a roll neck is that it is both very practical and very stylish; not many sartorial pieces fulfil both criteria so completely. It’s practical because in cold weather a roll neck protects both the throat and chest. And because, being knitwear, it allows great movement than a shirt or jacket. That also makes it great for travel. On the style front, a roll neck succeeds because it looks smart, ‘dressing the neck’ in a similar way to a shirt and tie. And because it frames the face. Framing the face is flattering, as any shirtmaker will tell you, in particular for anyone with an average to long neck (such as me). Roll necks also have nice historical associations of relaxed, elegant chic. 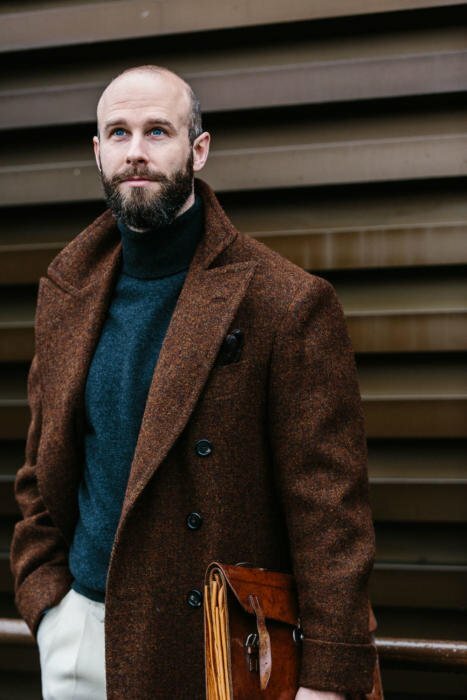 The downside of a roll neck is that it really looks best underneath a jacket or coat, rather than on its own. This is particularly true with larger men, where a shirt gives them a flattering V-shaped opening and a long vertical line in the placket, but a roll neck presents nothing but a big, dark block. Fine-knit versions are particularly unforgiving. A roll neck is therefore best on a day when you will be outside more than in. Or if inside, wearing a thicker model, perhaps with more vertical lines such as a rib or cable. On the subject of different styles and weights, I tend to have two in a colour: one that is thin enough to wear under a jacket, and one that is not, really being a substitute for a jacket. In the image above, I am wearing the thicker type - a ‘funnel neck’ style from Anderson & Sheppard. This is chunky, short and ribbed, and can be worn folded down (in which case a shirt collar would show above it) or up, jutting against the chin. In the latter case a close observer will notice the seams showing on the outside, but I don’t mind this in something so dark. In the second example, above, I’m wearing the lighter weight - a charcoal cashmere model from Drake’s. This works under a coat, but is particularly good under a jacket. There is also perhaps a third category: an ultra-thin version that is aimed at being closer to the thickness of a shirt, something like a 30 gauge. I have a lovely navy model like this from Edward Sexton, picked up in our pop-up shop last November. Even I, being tall and slim, would think twice about wearing this weight on its own, however. Best under something else, including under another layer of knitwear like a big shawl-collar cardigan. I know a lot of people find roll necks uncomfortable against the neck, particularly with stubble. I used to as well, but find I’ve got used to them over the years. I also sometimes wear a shirt underneath them (above), rather than a T-shirt, which means a collar sits between the neck and the wool. Unless the model is of the super-thin variety, the shirt shouldn’t disrupt the surface. 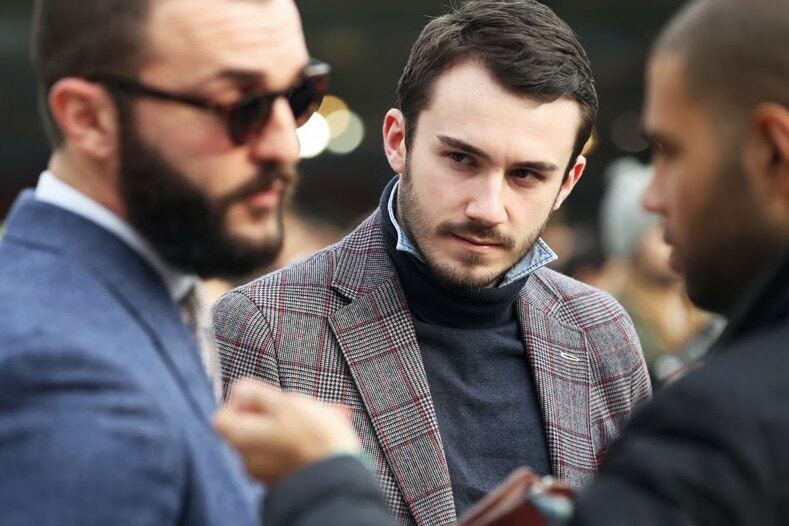 Finally, there is the Italian look of popping the collar of your shirt, so it sticks up out of the top. This is a bit too much for me, but if you can make it look like you’ve been doing it for years, it can look good. If you do adopt this look, try to use a relatively small or cutaway collar, so the points don’t stick too far out. Of course, given the time of year, there aren’t many roll necks available now. Drake’s and Trunk don't have any (I'm wearing a Howlin' model from Trunk Clothiers in the navy watch-cap shot above). 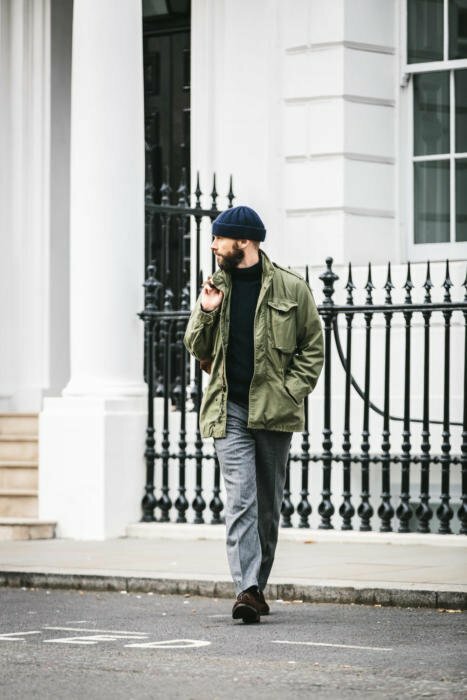 However, Anderson & Sheppard largely eschews the seasons and has a few roll necks and funnel necks left, and Sexton actually has its on sale (£165 down from £275). 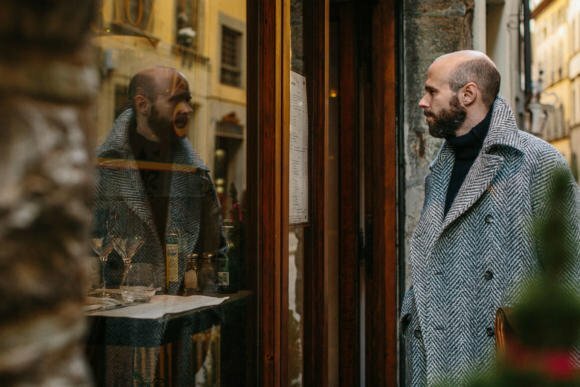 At its core, I think I love the roll neck because (like most menswear I love) it has a distinctive style without resorting to loud pattern or other extremes. It is simply chic, warm and comfortable. You can follow the discussion on The roll neck by entering your email address in the box below. You will then receive an email every time a new comment is added. These will also contain a link to a page where you can stop the alerts, and remove all of your related data from the site. Completely agree with you on the roll neck. I recently bought a slim cashmere version from new and Lingwood. Loved it so much that I went back and bought another two in different colours. However it takes some time to find the right size in their jungle of slim fit, standard fit and easy fit. BUT then they also have roll necks in fine cotton. That again has proved to get wider with wear, so one almost has to size down from the wool model. But once you know…. They have some roll necks in their sale now. Is Edward Sexton opening kind of a “brand store” on Savile Row or is that just a rumour? No, Sexton have no current plans to do so. They’re expanding their RTW, and showed some of it in our Savile Row pop-up store, but no plans for their own store – though they will need somewhere bigger than the current showroom at some point. What about wearing a fine gauge polo under a more chunky shawl collar cardigan? I think you may have discussed this before. Also, will there be a future review of the Connolly drop-shoulder herringbone coat? It looks great! As it happens, I purchased a lovely cashmere roll neck from the Armoury’s Landmark store in Hong Kong three days ago; I’ve been pretty much living in it since returning to London. I’ve always liked, and had at least one, usually black, roll neck in my wardrobe. I recall that back in the late 60s there was a brief fashion for wearing rollnecks with evening dress. They were made out of shirt material and had a zip to compensate for the lack of stretch. I didn’t buy into that. 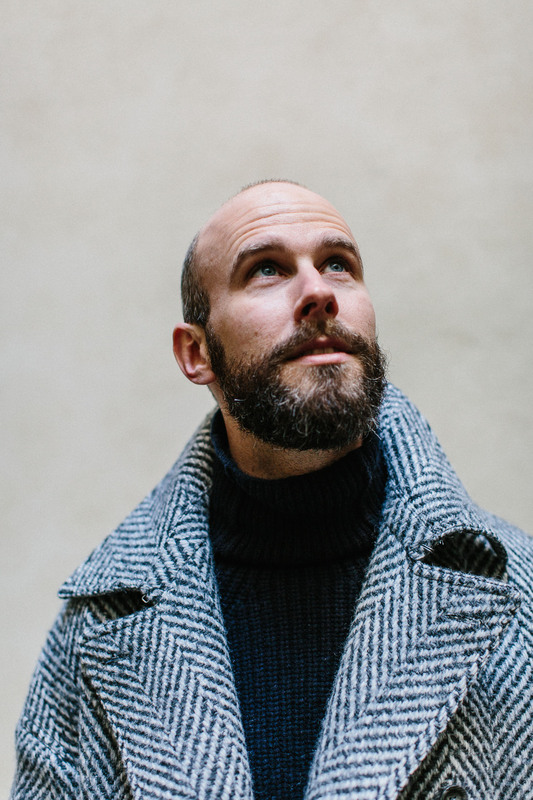 Whilst you may mention historical chic, don’t overlook the fact that the roll neck sweater was originally conceived as a layer of protective clothing, sometimes made with oiled wool, for those working in harsh conditions, such as mariners and farmers. Nothing chic about that. Nice article Simon. I agree that the roll-neck is best worn under a jacket. Perfect for running errands in, layered under a field jacket with jeans and boots. I bought a few from Cordings recently in a very soft geelong lambswool. Excellent quality and a very fair price point. Very happy to read this as I am currently looking for a roll neck… Being very tall, slim and with long arms, is there any brand/model you could recommend? I am looking for something slim fitting (similar to the A&S shetland sweater). Thanks! I love the roll neck, I just do not understand when people put in inside the trousers like a shirt. an informative article as usual. And it is published as if on cue, because it is getting colder again. I received a fine roll neck in charcoal a few days ago. A medium blue (baltic blue) one I will send back, because I don’t think it is easy to combine. Or I am wrong? Beside the colour navy, which ones would you suggest also? Are there some rules to bear in mind how to combine their colours with jackets (e.g. sufficient contrast)? Yes contrast is a good rule, but otherwise treat it like normal knitwear. Not burgundy or brown? Would you apply those colours as a general rule for starting a knitwear capsule collection generally? And no, I’d go for a deep green first. If looking at browns, probably a lighter, biscuity brown. Indeed, a rollneck belongs to any good wardrobe. Also worth highlighting is that they could be surprisingly hard-wearing as the ones you have mentioned in your post or in the comments. Great, thoughtful article – thank you. You covered all the bases on wear – I find it useful to have heavy and light guage and I find a shirt best under light guage – it sets up the collar and if too hot provides a better alternative than a T. As an alternative to the full roll over the ‘mock turtleneck’ (similar to a Guernsey – a high circular neck without the roll over) provides a great alternative being lighter and a better fit on shorter or thicker necks. As with another commenter I would love to see an article on the Connolly coat – nonchalantly, stylishly elegant and a great foil to the roll over – the weight, weave and most importantly collar cut look great on you (nice array of shots by the way). Hi Simon, slightly off topic question. I know Anderson Sheppard sweaters come highly recommended. 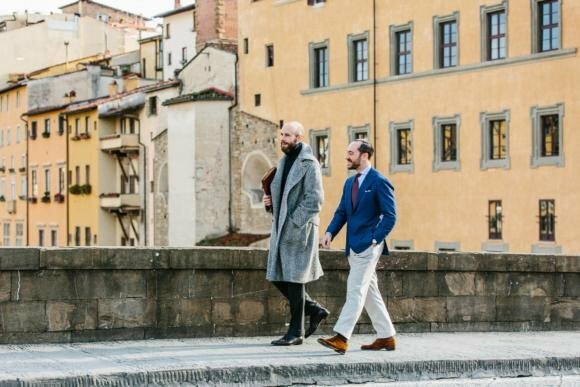 I was wondering whether the fit of their v necks and cardigans are more akin to their suits (drape cut) or more slim fitting with a clean silhouette like John Smedley sweaters, which are perfect under a jacket? I’m from Canada and roll necks (or turtlenecks over here) are a staple of my wardrobe. Merino wool for the milder months, cashmere for the winter. Is that possible for you to produce roll neck sweater? I think it’s really essential in men’s wardrobe. Thanks for the suggestion, but I can’t see any obvious gap in the market. Do let me now if you think I’m wrong. How about the extension of the PS finest knitwear? Really love the quality. Perhaps. The fineness certainly sets it apart, although you do get some pretty fine rollnecks as well. I’ll think about it – thanks for the suggestion. You are very late to the party when it comes to this one. Roll necks are also fabulous under corduroy suits and if the neck is loose, a neck square underneath is also a great look. N Peal have some great roll necks. There Fumo grey is an absolute staple. Am I the only one who finds it odd to wear a shirt underneath a turtleneck? I can completely understand how it feels odd, given no one will see it. It does give you the flexibility to take off the rollneck though, which you don’t have with a T-shirt if you want to remain smart. Can also look nice to be able to see a little cuff at the end of the sleeves of the rollneck, although that’s a pretty small point. 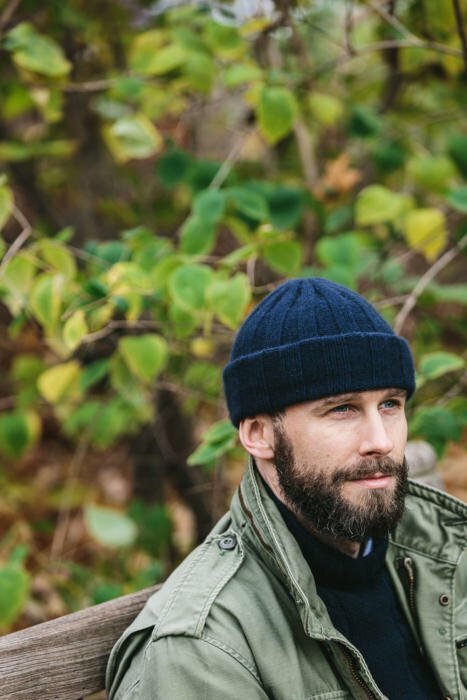 I have always worn roll necks but never with a shirt and even so it’s collar flipped up.But after reading this article I tried it o and guess what hat it looks so so good . I love polo/roll neck sweaters and have had a succession of fine cashmeres, as well as some thicker cableknit styles over the years. However, I find, after wearing only a couple of times, the necks become baggy and unsightly. I wear a 15 1/2 shirt collar (and do actually have a neck) but the appearance is so unsightly I soon stop wearing them. Am I an anatomical freak or does anyone else have this problem? 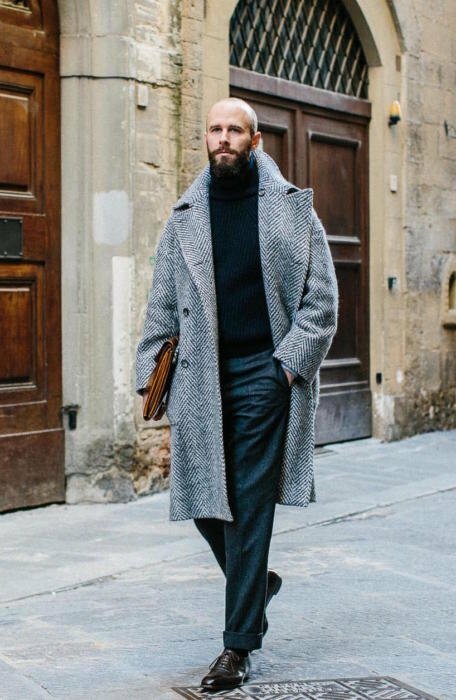 Do you have any recommendations on the height of the collar for a roll neck? I find most of the versions I try extend the full length of the next (i.e. right up to to the fold where my chin starts). I’ve wondered if it’s better for me to triple fold the collar so there’s a bit of neck free from the collar. What about wearing a rollneck with a suit? Is it better ‘suited’ to a Blazer odd trousers ensemble? Regarding the Connolly coat. Which size are you wearing M or L?